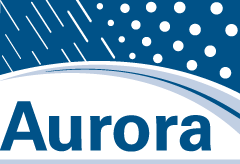 The Aurora program is a partnership of highway agencies that collaborate on research, development, deployment, of road weather information to improve the efficiency, safety, and reliability of surface transportation. It is administered by the Center for Weather Impacts on Mobility and Safety (CWIMS) which is housed under InTrans at Iowa State University. The mission of Aurora and its members is to seek to implement advanced road weather information systems (RWIS) that fully integrate state-of-the-art roadway and weather forecasting technologies with coordinated, multi-agency weather monitoring infrastructures. The Aurora vision is to use RWIS research conducted by member agencies to facilitate more advanced weather monitoring, more effective driving condition updates, and better forecasting capabilities for efficient highway maintenance and real-time information for travelers. Aurora’s initiatives are funded by member agencies to conduct research that serves the needs of its members who meet twice per year to set the agenda for RWIS research, keep informed about progress on program initiatives, and discuss solutions for common in-the-field problems. Newly selected initiatives are led by “champion” member agencies, managed by committees of Aurora members, and funded out of the pooled fund. These initiatives result in technological advancement and improvement of existing RWIS, significantly reducing the adverse impacts of weather on driving conditions.